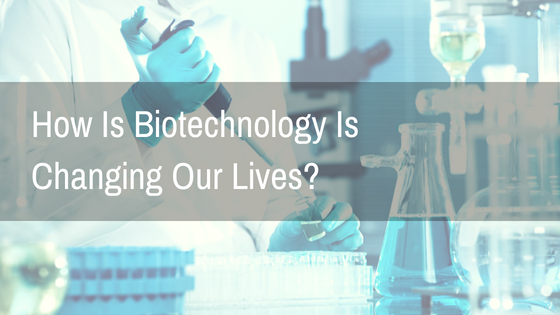 How is Biotechnology is Changing Our Lives? Home Study Tips How is Biotechnology is Changing Our Lives? Biotechnology is a powerful tool that can help humanity solve it’s biggest problems. From creating a disease resistant superfood to rewriting darwin theory of evolution, here’s how biotechnology is changing our lives. Biotechnology takes principles of biological sciences, such as genetics and finds practical applications for them. It could either be in the form of producing disease resistant crops, where there is no need to use pesticides or other harmful chemicals as the crops are genetically modified to be resistant against any diseases. Or producing fruits and vegetables that are significantly more nutritious than it’s traditional counterparts. This means enhanced nutritious and calorific value in foods. This can have practical applications such as in developing or underdeveloped countries where there is a shortage of food, which eventually leads to malnutrition. Advancements in molecular biology have enabled a whole new host of products that can tackle diseases more effectively than traditional medicine. Principles from chemistry and biology are applied for analysing the genetic materials of bacteria or viruses and then singling out the causative factors for a particular disease. Since the root cause or the factors that have been known to cause or initiate the disease have already been identified, the cure for that disease is much more effective as it targets that particular cause. Before the 20th century, if you lost an ear or any other organ from diseases or injury, that part of your body was gone forever. But now, advancements in biotechnology has enabled us to regrow certain organs and parts of our body. The scientist has been able to grow an ear suitable for human use from a 3D mould. Apart from an ear, an entire working oesophagus has been grown from a cocktail of tissues and stem cells. This feat will help cancer patients and people who have suffered debilitating injuries lead a normal life. Darwin’s Theory of evolution has explained how us humans have reached where we currently are in the grand scheme of evolution. Survival of the fittest: This meant organisms that had adapted to change had survived and the rest had become extinct. So evolution is carved by many factors that we do not have control over. Enter the test tube babies: These are genetically modified human embryos that have genes which are customized to the parent’s liking. These embryos possess features which cannot be naturally acquired through traditional methods of conception and they can give the specimen a significant advantage in its life. In conclusion, biotechnology has a lot to offer and its implications are limitless. Explore more about Biotechnology and other related topics by subscribing to our BYJU’s YouTube Channel to learn through 3D videos and in-air productions.